“We’re Only Alive For a Short Amount of Time”…so go see this play! By Beverly Friend, Ph.D., Member American Theater Critics Assn; photo by Liz Lauren. They needn’t have worried. It is not the plot that provides the brilliance of this world premiere production — it is the way that plot is presented. David Cale, author and star, plays all the characters and sings all the songs — smoothly and seamlessly moving from father to mother to brother to grandparent while weaving in just the right lyrics to reinforce thought, emotion and behavior. He doesn’t just tell his story, he enacts it — without doffing any hats or changing any garments. He remains the same Cale — and yet is somehow intrinsically different with each incarnation. In one vivid, climactic moment, he dialogues with himself as lawyer and witness creating both conflict and resolution simultaneously. What a tour de force! The press release and playbook do reveal some plot background before the show starts. The location is an industrial English town famous for its hat manufacturing. Cale is a victim of his parents’ dysfunctional marriage. He initially escapes by tending birds in an animal hospital he erected in a garden shed. Then, tragedy strikes. Revealing the tragedy and its vivid aftermath can in no way capture what Cale accomplishes on stage in this stunning performance. Telling a plot is two-dimensional; showing it is three — and (with Cale) maybe even more! The fact that this story is honed from his own life makes it even more memorable as Cale tells a history laced with humor and undercut by pain. It is a coming of age story — and a coming of wisdom. If we are only alive for a short time, Cale makes the most of it! The music swells and ebbs in much the same way as the musicians — with harp, viola, cello, trumpet, clarinet, and piano — appear and fade away again into the dark background. Cale wrote the lyrics, and he and Matthew Dean Marsh composed music for the twelve songs. These are not catchy tunes that will be hummed as you leave the theater. Rather, they are thoughtful, introspective works that bring you closer into the mind and heart of the singer. He is accompanied by a perfect ensemble composed of piano, harp, viola, cello, trumpet, and clarinet. In one of his many perceptive speeches, Cale notes that both the audience and the show watch each other. At the end, the mesmerized watching culminates when the audience rises as one to bestow a well deserved, standing ovation. 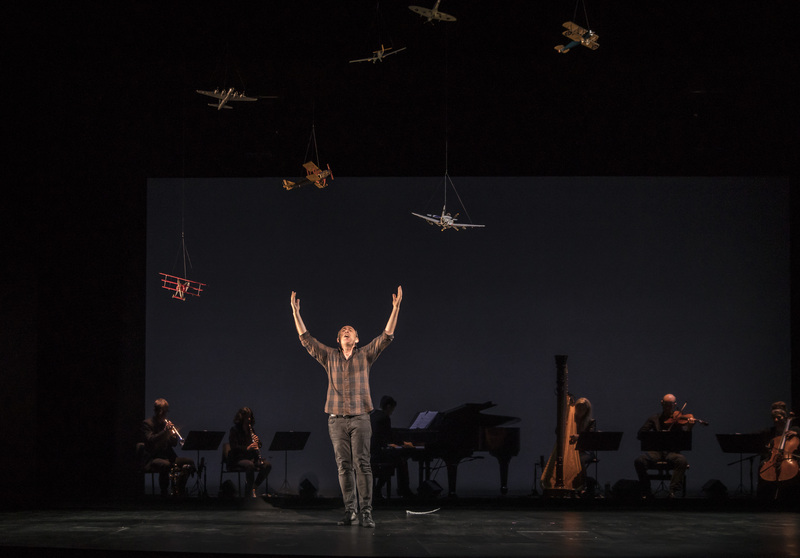 Kudos to Cale, to Musical Director Marsh, and the highly skilled ensemble created by David Belden, Michelle Campbell, Desiree Miller, Jered Montgomery, and Anna Najoom. Especial praise to Robert Falls, who never disappoints as a director. We’re Only Alive for a Short Amount of Time was part of Goodman’s 217 New Stages Festival, an annual celebration of new work by established and emerging playwrights. In the past 15 years, more than 80 plays have been produced. We’re Only Alive for a Short Amount of Time, Goodman Theater, 170 N. Dearborn, until October 21.Performance times vary. Check the web site at www.GoodmanTheatre.org. Find more information about current plays on our Current Shows page and at theatreinchicago.com.